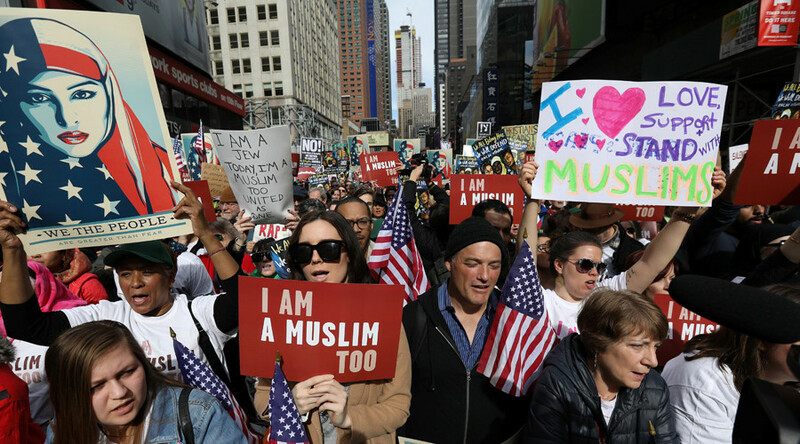 Protesters took to the streets of New York City's Times Square to take part in the #IAmAMuslimToo march, while separate anti-Trump demonstrations took place in other US cities. The rallies are aimed at speaking out against President Donald Trump’s recent travel ban on seven mainly-Muslim countries, and to highlight interfaith solidarity among the American population. The so-called 'muslim travel ban' has faced widespread condemnation both at home and abroad and is currently embroiled in legal challenges across the United States with the president vowing to redraft the executive order as early as next week. Co-hosted by Def Jam's Russell Simmons, together with the Foundation for Ethnic Understanding President Rabbi Marc Schneier and Jamaica Muslim Center’s Imam Shamsi Ali, the event began at the ‘Crossroads of the World’ at noon local time Sunday and was scheduled to continue until 4pm. #Repost @josuesejour1 ・・・ I am Muslim for a day. Practice spreading Love for all people. "We are here today to show middle America our beautiful signs and, through our beautiful actions and intention, that they have been misled," Simmons told the crowd. "We are here unified because of Donald Trump… We want to thank him for bringing us together." The hip-hop mogul previously viewed Trump as a long-time friend in a 2011 blog post and the same year arranged a meeting with the billionaire and a select group of interfaith leaders to discuss religious bigotry in the United States. Schneier, the founder and president of the Foundation for Ethnic Understanding, told AMNY "this rally today is for America. Do you know why? Because any harm that happens to the Muslim community, which is an integral part of this nation, is harm [upon] all Americans." Linda Sarsour, a Palestinian-American and one of the co-organizers of the Women’s March, was in attendance to show solidarity with other Muslims. Chelsea and Charlotte Clinton, the daughter and granddaughter of former presidential candidate Hillary Clinton, were also present at the rally to show support. Actor and activist Susan Sarandon also spoke at the event, calling for widespread denunciation of the travel ban while urging unity among people of all faiths and backgrounds. “If you are silent then you are complicit,” she told the crowd. Anti-Trump protests also took place in other cities across the US on Sunday. Several hundred people hit the streets of Chicago, marching from Trump Tower to Federal Plaza. One banner stated "Will trade 1 Trump for 10,000 refugees," while another said "History has its eyes on you." Organizers led participants in shouting "What do we do when immigrants are under attack? Stand up, fight back!" the Chicago Tribune reported. Hundreds of people also protested in front of Oregon's State Capitol on Sunday. Organizers said nearly 1,000 people turned out for the event. Demonstrators in Dallas took to the streets on Saturday, with police estimating that about 1,700 came out for the event, AP reported. About a dozen counter-protesters stood nearby in support of Trump. The Los Angeles rally was the first of its kind to appear on Facebook. More than 4,000 people have signed up to attend the event. Other protests are scheduled to take place in New York, Washington DC, Chicago, Kansas City, Denver, Milwaukee, Salt Lake City, and Atlanta.